Note that all our blogs are now together in one - so even though this link takes you only to the S&S portion of the blog, subsribers automatically get all the inspiring Hero Blog posts by email, too! Pssk! RUN. . . do not walk, over to the NEW BLOG to participate in this weeks' Tuesday Tutorial on how to do an Iris Fold. 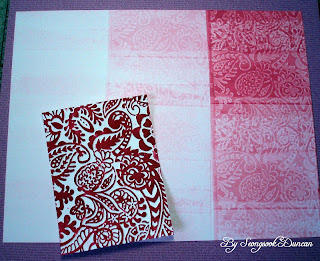 Learn how to use your favorite embossing folders to make these beautiful matching patterned papers! Go, dust off your brayer, and find us here. Here's a teaser. . .
Hello, cardmakers! Happy Sketch Day! 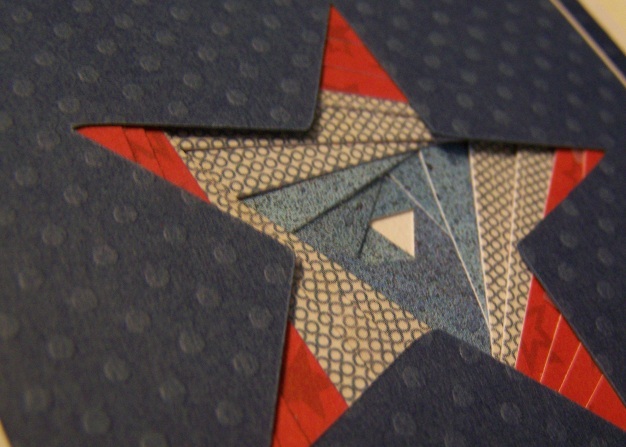 Before we get to it, are you working on a box for the "Duty Honor Cards" Drive? Our shippers need those boxes to keep cards going out to our heroes all summer long! We have two great sample cards to share this week, both from cardmaker Pam. She has a great blog called AirborneWife's Stamping Spot, and you should definitely check out to see more of her awesome work. I can't decide which of these two I like best, the candy or the clouds... they are both so adorable. Thanks so much for your help this week, Pam! Off you go, folks, to figure out what you're going to put in the big box in this week's sketch. Be sure and come back here to show us your work, and visit the others that link up for more inspiration! Hello everyone! Are you ready for your Friday dose of inspiration? I have a wonderful group of cards to share with you that were created by this week's featured cardmaker Veronica. I know you will be as inspired by them as I am. Veronica, for whom English is a second language (I hope I've done an okay job with your answers Veronica), doesn't blog so I hope you will take a moment to leave her some love here at the end of this post so she will have a chance to know how much you like her cards. I've been scrapbooking for at least 12 yrs. About a one year ago, I think, I bought a card magazine which is where I found out about about OWH. I checked it out on the computer and I was so excited and started sending in my cards. Of course now I am a so addicted… I love it… and I'm so thankful to our heroes. Since my son has moved out I now have my OWN craft room and I am so happy! I have my stamping table, room for all my papers (I loooove paper) and stamps, my cricut and embossing supplies. I went to a stamp show and fell in love with the stamps from La-La-Land. I love Marci! I also discovered (and love) The Stamps of Life by Stephanie Barnhard too. My favorite technique is using the distress inks by Tim Holtz. I've also discovered Copic markers and love to color with them. When it comes to colors I think it depends on the card. I love reds, browns, purples and pinks. I love to stamp on beige cardstock and use it a lot. I love to buy all the card magazines and I heard about OWH in one I read. Mine is just a little part and it’s such a small thing to do what I do for them, when they do so much for us. How can we really ever say thank you? When I read about the children getting the cards from OWH and they have a little of their parents, moms or dads, saying I love you or I miss you it brings my heart great joy. And I always pray for all of them and their families. Wowzers! Did y'all see all the great sketch cards on the bloghop? If you haven't started working your way through all 126 (126!) stops on the hop, get started by clicking here! There is a lot of inspiration to be had on the 'hop! How about a new sketch... or two? Just a couple of reminders for new folks: all OWH sketches are designed for A2 sized cards (5.5" x 4.25") since that is what we prefer to receive, and the heart shape indicates the embellishment of your choice - doesn't have to be a heart! Our sample today was made by Sue K. She has a blog called Little Bits of Randomness where you can see more of her great cards and three very cute dogs. I just love the text-y background paper used here. Thanks so much for such a great card, Sue! But wait! There's more! Yesterday on my stop in the bloghop, I offered up a bonus sketch, and I'm copying it here as well. Have fun with it! I don't have a sample for this one, so whoever makes one and links it up first on our Inlinkz tool below will become our sample! Enjoy the remainder of your weekend and don't forget to come back here and link up your cards so we can all share the inspiration! You're one click away from the bloghop post...live at 5am EST!